Lehtonen, Päivi; Martinsuo, Miia: Integrating the change program with the parent organization; in: International Journal of Project Management, Vol. 27 (2009), No. 2, pp. 154-165. Lehtonen & Martinsuo analyse the boundary spanning activities of change programmes. They find five different types of organisational integration – internal integration 1a) in the programme, 1b) in the organisation; external integration 2a) in the organisation, 2b) in the programme, and 3) between programme and parent organisation. 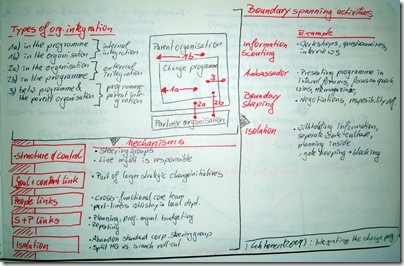 Among most common are four types of boundary spanning activities – (1) Information Scout, (2) Ambassador, (3) Boundary Shaping, and (4) Isolation. Firstly, information scouting is done via workshops, interviews, questionnaire, data requests &c. Secondly, the project ambassador presents the programme in internal forums, focuses on quick wins and show cases them, publishes about the project in HR magazines &c. Thirdly, the boundary shaping is done by negotiations of scope and resources, and by defining responsibilities. Fourthly, isolation typically takes place through withholding information, establishing a separate work/team/programme culture, planning inside; basically by gate keeping and blocking. Waard, Erik J. de; Kramer, Eric-Hans: Tailored task forces – Temporary organizations and modularity; in: International Journal of Project Management, Vol. 26 (2008), No. 5, pp. 537-546. As a colleague once put it: Complex projects should be organised like terrorist organisations – Autonomous cells of highly motivated individuals. Waard & Kramer do not analyse projects but it’s fast paced and short lived cousin – the task force. The task force is THE blueprint for an temporary organisation. The authors found that the more modularised the parent company is, the easier it is to set-up a task force/temporary organisations. Waard & Kramer also found that the temporary organisations are more stable if set-up by modular parent companies. They explain this with copying readily available organisational design principles and using well excercised behaviours to manage these units. The more interesting second part of the article describes how a company can best set-up task forces. 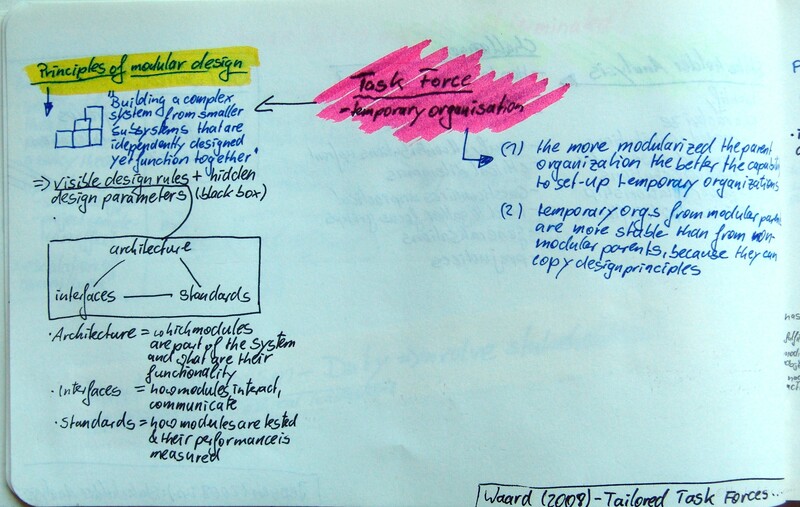 Waard & Kramer draw their analogy from Modular Design. The core of modular design is to establish visible design rules and hidden design parameters. The authors describe that rules need to be in place for (1) architecture, (2) interfaces, and (3) standards. The remaining design decisions is left in the hands of the task force, which is run like a black box. In this case Architecture defines which modules are part of the system and what each modules functionality is. Interface definition lays out how these modules interact and communication. Lastly, the Standards define how modules are tested and how their performance is measured. Ratcheva, Violina: Integrating diverse knowledge through boundary spanning processes  The case of multidisciplinary project teams; in: International Journal of Project Management, in press, corrected proof. The author argues that diverse, multi-disciplinary teams have knowledge boundaries which make information sharing difficult. An issue even more difficult if the team is geographically separated. Ratcheva conceptualises the diverse project team as being embedded in the macro environment and organisational environment. The team itself is characterised at its starting point by three factors – (1) interpersonal, interactions & relational capital, (2) knowledge diversity, and (3) establishing workpractice. These three factors influence each other. Starting with this diverse team context or setting the team goes on to integrate it’s knowledge which ultimately leads to a project outcome. 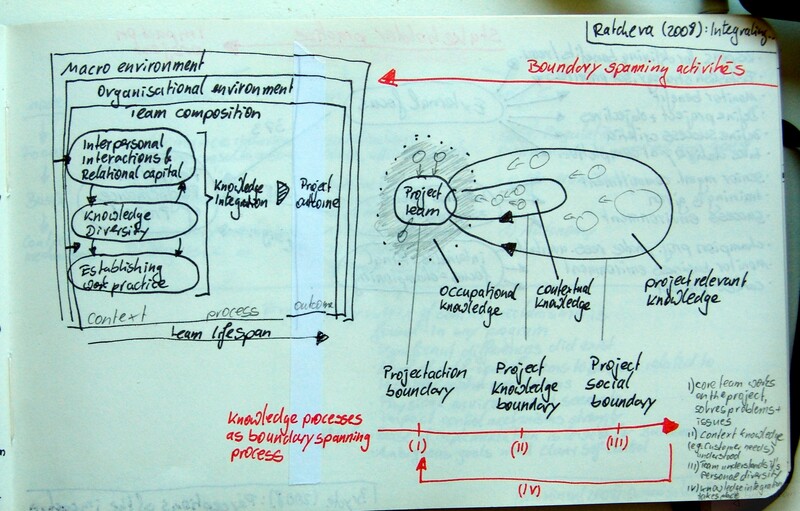 Which knowledge boundaries exist in such a project team? Ratcheva identifies three different knowledge domains and at the edge of these knowledge boundaries. First of all there is the project team, surrounded by it’s projectation boundary, outside this boundary lies the occupational knowledge. Which simply means that each project team member is rooted in a broader knowledge of his profession which goes beyond the boundaries of the current project. Secondly, the team has contextual knowledge which is confined by the project knowledge boundary. Thirdly, the broader project relevant knowledge lies inside the project’s social boundary. How does the concept look like in motion? 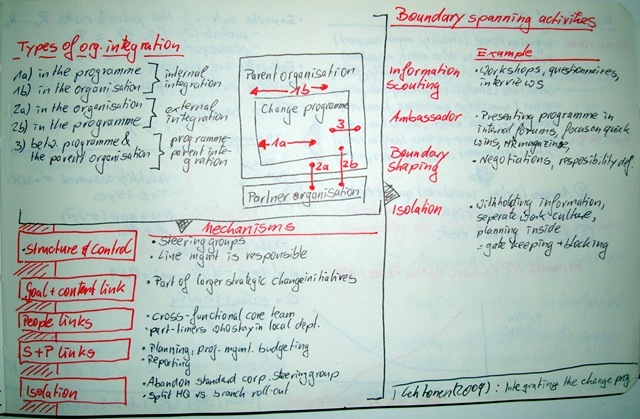 Which boundary spanning activities does the team perform? Ratcheva describes a four step process which combines all knowledge related and boundary spanning activities. Lehtonen, Päivi; Martinsuo, Miia: Change program initiation – Defining and managing the programorganization boundary; in: International Journal of Project Managment, Vol. 26 (2008), pp. 21-29. Lehtonen & Martinsuo analyse change programs from a social perspective. Therefore programs are characterised as complex temporary organisations in an uncertain, dynamic context. The authors study the boundaries of change programs and identify boundary spanning activities and actors. Their research results show the need of each program to run through several iterative cycles of integration with and isolation from the parent organization during the project initiation phase. Actors (i.e. people) on the project define and shape the boundary, while also representing and legitimising the program. In further interactions with the parent company these actors scout for information, negotiate, ensure continuity, and guard & isolate themselves. Such interaction happens on an inidivdual level rather than on a team level. The organisation’s middle managers and the project’s central managers are the key interaction partners.